Wladimir Klitschko insists he can fight Dereck Chisora on 30 April and then take on Britain's WBA champion David Haye two months later. Klitschko, 34, the IBF, IBO and WBO champion, has also queried whether Haye will retire when he turns 31 in October, as he has indicated. The Ukrainian said: "I don't need a half a year to prepare for Haye. "Me fighting Chisora first is good promotion for the fight because the guy is also British and very loud." Londoner Haye, whose most famous victory was against the giant Nikolay Valuev in 2009, most recently disposed of Audley Harrison in the third round in November. Assuming the Klitschko-Chisora fight goes ahead, Haye would be expected to take on a mandatory challenger or face having his WBA title stripped from him. However, if he were to finalise a unification bout against Klitschko he could apply for an extension to avoid having to fight twice in a short space of time. 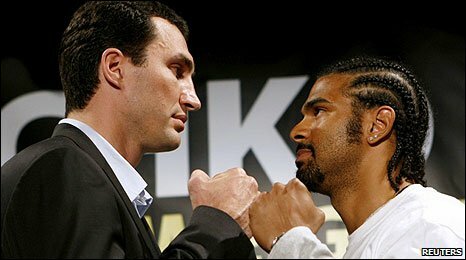 However Haye has recently cast doubt on Klitschko's ability to take him on barely two months after fighting Chisora. "A bout with me is the most lucrative, meaningful and dangerous fight Wladimir's ever had, not some throwaway tune-up," said the Londoner. "Wladimir won't fight anybody nine weeks after Chisora, let alone me." But Klitschko, who is also in talks to fight Tomasz Adamek in September, insisted Haye can sidestep the mandatory challenger, Ruslan Chagaev, and face him in July. He said: "I don't take David Haye as a super-special fight. I'm always in shape anyway. He could give Chagaev step-aside money and then I'm going to be there with nobody to fight. "Because of our history before, I would fight him on 2 July and we would work on the contract, but I would fight Chisora first. "There have a been a lot of lies from David Haye and [trainer] Adam Booth. We found a date, 2 July, to fight him, but I don't trust these guys any more." Haye claimed last week that if Klitschko did not fight him before his retirement date the Ukrainian would be forever linked with a failure to take him on. But Klitschko does not believe Haye will end his career this year as he will not want his legacy to be the one-sided win over Harrison. He said: "He's telling everyone 'I'm going to retire by the end of the year and I will have my legacy'. He's going to have a legacy for the Audley Harrison fight - the most exciting heavyweight fight in history. "He has no legacy whatsoever. He has this terrible disease and he has to retire? What is that? This is total nonsense. He is playing the media. "He will not retire because he's a liar, liar, liar. From the beginning to the end, he's a loser liar. That's the truth about this man. "David Haye has accomplished nothing in the heavyweight division other than to present himself with his stupid T-shirt and comments. "This guy will eventually fight me."